Open reading frame 14 (ORF14) of Varicella zoster encodes for late glycoprotein C (gC). 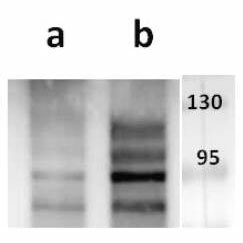 VZV gC is 105-kDa highly glycosylated protein with almost one third of its molecular weight consisting of oligosaccharide chains on four predicted N-linked glycosylation sites and 25 O-linked mucin type sites (Journal of Virology (1990) 64, 4540-8, Virology (2008) 382, 171-81). Unlike other major glycoproteins in herpesviruses, it shares only 30% homology with HSV-1 gC (Reviews of infectious diseases (1991) 13, pp. S960–S963). It shows delayed transcription and protein expression when compared with other major VZV glycoproteins (gE, gI, gH and gB) as well compared with HSV gC in infected cells (Virology (2008) 382, 171-81, Current Topics in Microbiology and Immunology (2010) 342, 113-28. 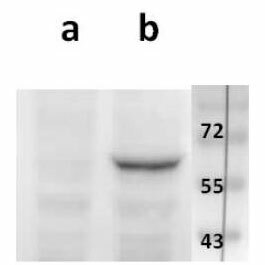 VZV gC expression is reduced in VZV-infected neurons on both transcriptional and protein level (Journal of Virology (2013) 87, 9643–9648 6). 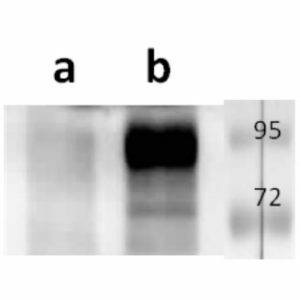 Our anti VZV ORF14 antibody VZ 14.12 shows that the VZV gC is located predominantly in the Golgi. 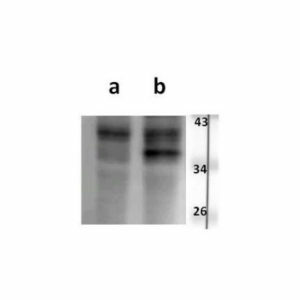 Our anti-VZV ORF14 antibody VZ 14.12 works in ELISA (on immunogen), IF (on VZV infected cells) and each LOT is validated for Western blot (of VZV infected cell lysates, described in J Virol. 2013 Jun;87(12):6943-54.). 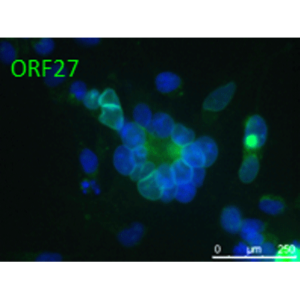 VZV ORF27 encodes a nuclear egress lamina protein, that together with the nuclear egress membrane protein encoded by the product of VZV ORF27, most likely plays a role in the egress of assembled viral capsids from the nuclei of VZV infected cells to the cytoplasm. 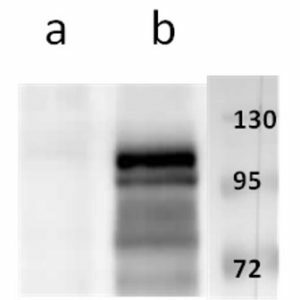 Open reading frame 37 (ORF37) of Varicella zoster encodes for envelope glycoprotein H (gH). 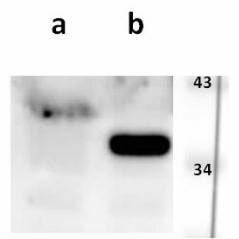 VZV gH is a 118kDa type 1 transmembrane glycoprotein highly conserved among other alphaherpesviruses. ORF48 encodes an alkaline nuclease (J Virol. 87: 11936-11938). ORF48 protein is homologous to herpes simplex type 1 (HSV-1) UL12, human cytomegalovirus (hCMV) UL98 and Epstein Barr virus (EBV) BGLF5. VZV ORF11 encodes a tegument protein, an orthologue of HSV1 protein UL47 which is highly conserved among alphaherpesviruses. 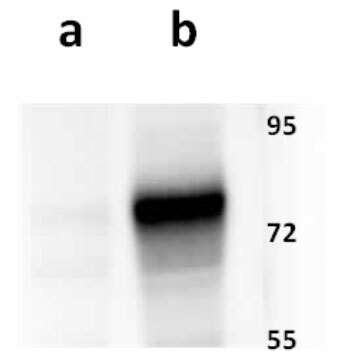 Open reading frame 68 (ORF68) of Varicella zoster encodes for essential, most immunogenic and most abundant glycoprotein E (gE). VZV ORF41 encodes a ~34 kDa protein that is packaged into the nucleocapsid core of the VZV virions together with protein products of ORFs 20, 21, 23, 33 and 40.